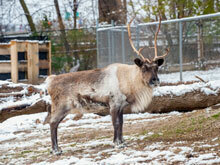 The Milwaukee County Zoo’s December is sure to be merry and bright! The Zoo is celebrating the holiday season and spreading joy to the public with Frosty Free Week, an entire week of free Zoo admission, from Dec. 25 to Jan. 1. The Zoo’s 125th anniversary celebration tops off with a week of giving at the Zoo. To commemorate the anniversary, an ice sculpture celebrating the Zoo’s 125th anniversary will be displayed. The Frosty Free Week is available to ALL visitors, who will receive free admission to the Zoo from Dec. 25 to Jan. 1 (regular parking and concession fees still apply). The Zoo is open from 9:30 a.m. to 2:30 p.m. Monday through Friday and 9:30 a.m. to 4:30 p.m. Saturday and Sunday. The Zoo is open 9:30 a.m. to 2:30 p.m. on Christmas Day and New Year’s Day. Bundle up and visit some of our cold weather animals, including Snow Lilly, the polar bear, the harbor seals and caribou. See if you can spot our reindeer! Stop by and say hello to some of the newest additions to the Zoo, including giraffe, Kazi, and Ayrshire calf, Kelly. Plan a family outing to enjoy the Zoo for free this holiday season, as the Milwaukee County Zoo celebrates the end of its 125th anniversary and rings in the New Year. 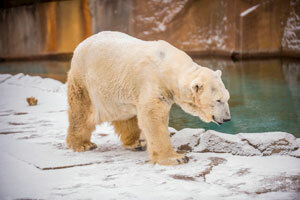 For more information on Frosty Free Week, call the Zoo at 414.256.5466.